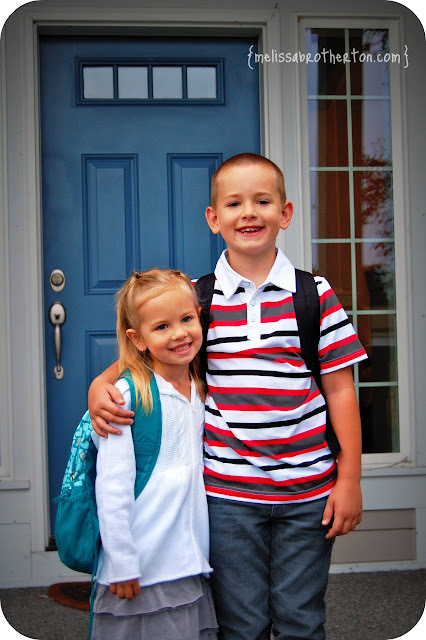 Today Elijah and Cora had their first day of school…almost two weeks after all the other kids in their class. Excitedly they put on their new clothes, carried their new backpacks full of school supplies and new lunch boxes full of enviable snacks. Cheesy grins and tilted heads came out for the obligatory “first-day-of-school” picture, and then we were off. The closer we got to the school, the more they shared about their fears relating to a new school, new teachers, and new friends. Escorted by the school secretary, we dropped off Eli first, barely saying goodbye before she whisked us off to Cora’s class. Looking back his eyes were Charlie Brown-ish in their wide-eyed anxiety. I waved again, to reassure him, and hurried to catch up. Cora giggled her way through introductions and instructions on where to place her lunch and backpack. She too looked fearful, but covered it up with giddy energy. Once again I’m sending a baby off to school, feeling the slight give as she pulls a step away from me. I wanted to yank her back, hold her in my arms and run with her to Eli. The amount of change and transition they have experienced in the last few months has been overwhelming. Instead, I walked away, smiling a reassuring smile; my heart tap danced inside my chest. Calling Josh, we talked about how nervous we each were for them, while at the same time reassuring one another that they would be fine. Six hours later I picked them up; they non-stop chattered about playing Lava Monster at recess, learning to write lowercase “l,” and how they saw each other at lunch. First days of school always get me. This year my son started fifth grade and I’m just amazed at how time has flown. Your kids are precious! I was visiting my future location of residence and my nephews there wanted me to take them to their first day of school. One of them cried and cried because it was his first day ever at school. Broke my heart in two. Oh I could just cry reading about leaving them at school! (I think my hormones are still a little crazy…) I’m so glad they had a good first day! I’m sure it’s nice to have more of a routine again. Am I the only one who thought “two weeks late” was a pregnancy announcement??? ?